H.264 finally a first class citizen in #WebRTC stacks. In the case of pre-recorded media, or very low latency / slow streaming, you can optimise this, and it starts looking like an usual HLS / CDN solution (see below). In those cases, the first half of the line is not time sensitive at all, and this leads to some asymmetry between the preparation of the media (up to the upload to a CDN), and the serving of the media which is more time-sensitive. A lot of people trying to optimise the pre-recorded content streaming will address either one of those half. For example, in the webrtc community, peer5, streamroot.io and others will address the second half by offloading some of the CDN-to-viewer content to a webrtc’s datachannel-based p2p network created on-the-fly between viewers of the same media. 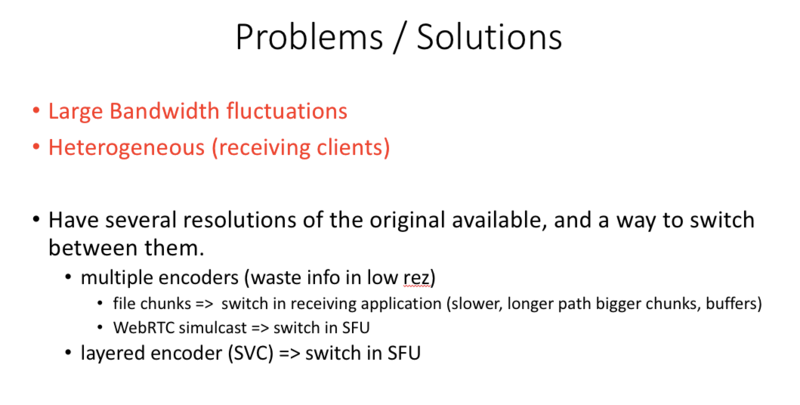 Meanwhile, in the codec community, AOMedia’s AV1, and any new codec for that matter, will address the entire by trying to find new codecs with better compression ratio, reducing the overall bandwidth need. While AV1 has SVC capacity, it is likely that it will not be used for bandwidth adaptation in those case. At AOMedia, the Real-Time group is a sub-group of the Codec group, illustrating the order of the priorities. A lot of companies in the blockchain / dApps / web3 ecosystem, are taking this Streaming model and try to optimise separately different segments: generation, transcoding, storage, distribution, …. While most aim at pre-recorded content, a.k.a. VOD (VideoCoin, theta, livepeer, viewly, …), only a few can do live (5s delay) streaming (livepeer, IPBC, …), and only one today is aiming at real-time (less than 1s, spankchain). handling large variations in the capacity of receiving clients,. Before the avent of SVC codecs, the main solution was multiple encodings of the the same media at different resolutions on the sender side, and mechanism to chose which resolution would be used by the receiving side. Streaming / Broadcast protocols like HLS or MPEG-DASH implemented this with transcoders, file-based chunking, and buffering, all which induced additional delay. Real-time protocols like Webrtc used “simulcast”. Usual streaming design (HLS) encode once at the source, upload this high resolution media up to a transcoder, and then transcode into different segments of same duration, one for each resolution. Most of those streaming “live” through Youtube, Twitch, Dailymotion or any other streaming service use OBS-studio, which capture, encode and stream over flash to an ingress node, which in turn transcode. Simulcast is doing exactly the same transcoders do for HLS, but directly at the source. That keeps things real-time (removing a decoding + encoding cycle in the process) at the cost of an overhead (CPU, upload bandwidth) on the sender side, as the source machine need to now have the same capacity an HLS transcoder otherwise has. Simulcast is for many the minimum acceptable to have industry quality media. Jitsi for example decided not to support Sfari iOS in their official SDKs because of lack of simulcast support with H.264, and is using a native client instead. For those interested in all the details, or those who wants to hear it from Emil itself, the recording is public, and the interesting part is around 18 minutes in. So far, libwebrtc, the webrtc media engine implementation used in chrome, firefox and safari, did not support simulcast in conjunction with the H.264 codec. Apple supporting only H.264, it was leading to a poorer experience with H.264 in general, and with Safari specifically. While a patch for extending libwebrtc engine simulcast implementation to H.264 had been proposed by HighFive almost two years ago (and used in their electron native client for just as long), and while it’s likely that many had done the same thing in their native apps, it had never been merged. Time had passed to the point that the underlying C++ class changes had been too great to actually even reuse this patch. Starting anew, from the VP8 simulcast implementation, CoSMo’s Media Server Lead Sergio Murillo that most of you must know from his article on SVC wrote a patch, and submitted it for review around the end of march. 3 months, 45 reviews with as many rebasing, and quite a few face-to-face meetings all around the globe later, we are happy to announce that the patch was merged today! 4. How does that impact my product, and what about the other browser vendors? The main impact is that you will not have to choose between using the H.264 codec and having a good quality media engine anymore. Using chrome canary this week, and chrome stable in around 12 weeks, you will be able to send H.264 simulcast. Firefox and edge have not commented on their intend to implement it. It is likely that firefox will adopt it soon, as their webrtc code uses libwebrtc media engine. Apple is planning to implement it during the web engine hackfest, first week of october, with CoSMo’s help. Simulcast is a sender side feature used to address bandwidth fluctuation on the receiving side. That means you do not need any modification on the receiving side to support simulcast, only on the sender side, and possibly in your media server. That also means you do not need to wait until this is implemented in all the browsers, to benefit from it. In the one-to-many streaming/broadcast use case, all you need is to make sure the sender uses chrome. There is no additional work to do to support any browser, including safari on iOS. For the many-to-many video conferencing use case, where all the clients need to be able to send *and* receive, you will have to wait for all browsers of interest to fully support it. It’s likely that very fast most media server will upgrade their support for this (they already support simulcast for VP8), and allow one not to bother at all. At CoSMo, we already made our media server Medooze compatible with the changes, and all our products, services, and our customers’ are going to be upgraded before the end of the month, and tested right away thanks to KITE, the same tool that tests WebRTC implementation in all browsers today, and which is used by callstats.io to validate stats implementations in all browser, for example. all our libwebrtc packages, Qt / obj-c / Java wrappers, and corresponding native and electron apps. All those, and a lot more (likely including Janus and Jitsi) will be the first in their category to adopt the latest available technology, giving them an undeniable edge. If you too, you want to get an edge over your competitors, use cosmo expert services, and/or products. At this day and age where everybody and their mom claim to be WebRTC experts (and fearless visionary leaders), remember that talk is cheap, and ask to see or test the code! Thanks for the information. Was waiting for such a move from the developers to have H264 with simulcast. Please update the blog when its fully implemented. Mind explaining how to enable the field trial in Chrome? Hi clement, not at all. You can see some of the flags in chrome://flags/ web page. Unfortunately this is not the exhaustive list of flags. I don’t think H264 simulcast is enabled. Didn’t see it in the release notes and never saw a PSA about it. Hi pablo. You already asked the question on discuss-webrtc, and every possible bug related to H.264, so I guess you know as much as I do 🙂 On a side note, in this community it is usually frown upon to repeat the same question on different venues. We see them all. If we do not answer, it means we do not have the answer or cannot legally comment. Here is what I can say. The code has been merged in the code base, you can check it from the original patch, with the commit link. It is NOT shipped by default in chrome right now pending some internal legal discussion, as by Thursday last week. My understanding is that once this legal discussion, of which I have no detail of, do not ask, is over, and upon green light from the lawyer, the PSA will be made on the mailing list.